The Library will be open on Saturday mornings for a trial period starting in May. During the trial we will assess the level of use and make a decision about continuing for longer. Friday March 29th saw the Library host its first music event. In collaboration with the Raunds Music Festival we hosted "Songs and Sources" with Ock 'n Dough, the well known local group. In the pleasant surroundings of the Library the audience were entertained with a collection of songs from across the county, put in context by means of stories and references. The musicians commented on the quality of the venue and the audience said it had been a great evening. We hope this will be the first of many such events. The Raunds Library is open and continues to be an essential part of the Raunds community. To celebrate this, the Raunds Library Committee is putting on a musical event on Friday March 29th at 7.30pm. If you have not been to Raunds Library recently why not pop in to this event. Ock 'n Dough present a fringe festival show "Songs and Sources", singing and revealing the stories behind East Northants songs and tunes. We have been monitoring the level of use during the extended evening opening. Whilst people are using the Library they are doing so earlier in the evening. We have thus decided to close the Library at 7pm on Thursday evenings, starting on February 14th. Remember that we still want you to tell us when you want the Library to open. Fill in the survey at the Library. The NCC Consultation about the future of libraries across the county ends on Feb 8th. There is less than a month left for you to make your views known. You can fill in the form online or ask at the Library for a paper copy. There is a separate questionnaire for young people. 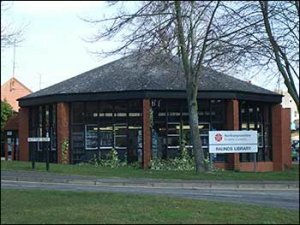 PLEASE let NCC know your views about the planned move to a Community Library here in Raunds. But remember the chances of a turnaround by Council seem slim/remote so a Community Library run by the townspeople seems the best way forward. NCC are holding a Drop-in session in order to seek people views on the future of the Library here in Raunds. They will be answering questions but more importantly trying to find out what people think. We have now received more information from NCC and are a little clearer about where we stand. There has been a "re-definition" of which Libraries must be kept open in order for NCC to meet its statutory obligations. Thrapston now falls into that category although it must be run by the community. But if the community is unable to run the library then NCC will step in to keep it open. Here in Raunds the community must run the library BUT if we are unable to do so then there is no safety net, NCC will not support us. So we seem to be in the same situation as before. It is all down to us! It was great to talk to those people who dropped by our stall at the Switch-on ceremony. And even better that we managed to sign up some new volunteers - thank you all. Remember that we are now open until 8pm EVERY Thursday. Drop in, have a chat, borrow a book, have a coffee, we would love to see you. But most importantly tell your friends! Raunds Library Management Group is working to ensure the continued existence of a library in Raunds with the support of the Town Council and a gallant band of volunteers. If you are willing to help get in touch. If you wish to volunteer please email us on the address above or collect an application form at the Post Office or Council Offices. Return your form to the Council Offices.